NO because the calculator seems to only work sometimes! usually works but it depends exactly what you apply it to. I think I can clarify a couple of points regarding f/# vs NA. First of all, I will disregard details such as entrance pupil location and principal planes, as well as the index of refraction of the medium. The f/# is defined as the focal length / diameter. 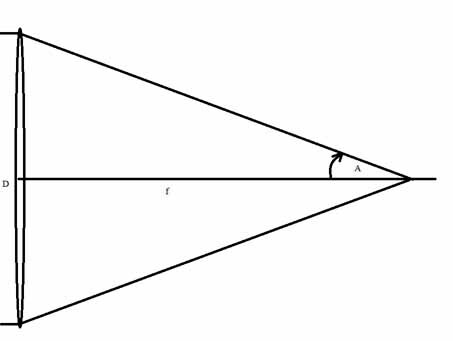 The numerical aperture is n*sin(A), where A is the half-angle of the cone. These are described in the figure below. So, since f/D is equal to f/(2*(D/2)), and the tangent of A is (D/2)/f, we can see that, with a little algebra, f/# = 1/(2*tan(A)), and NA = sin(A). 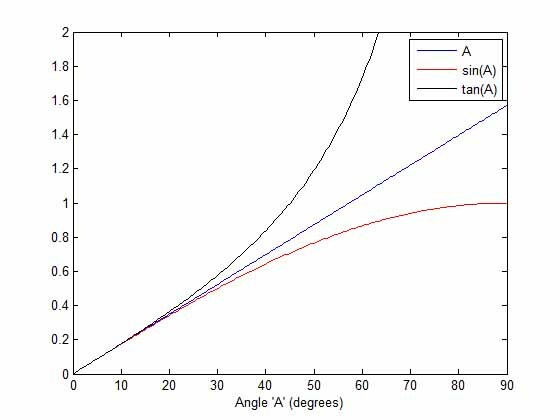 Now, in the small angle approximation, (in radians) A = sin(A) = tan(A), so the formula that f/# = 1/(2*NA) is based on the small angle approximation. The graphs of A, sin(A) and tan(A) are shown below. As seen in the figure, this approximation starts to fall apart at A about 20°, or a cone angle of 40°. The values at 20° are sin(20)=0.342 and tan(20)=0.364. So, the NA here is about 0.35 in air. Faster cones than this do not follow the small angle approximation very well, so f/# = 1/(2*NA) starts to become a worse and worse approximation to reality. 1/f = 1/i + 1/o, where i and o are the image and object distances. You have fallen prey to the common myth that f# and NA are only approximately related by f# = 1/(2*NA) because sin() is only approximately related to tan(). I used to think that also, and then I got enlightened. It turns out that the simple relationship is actually exact, for quite an interesting reason. Another interesting thing is that despite all the words written about principal "planes", the fact is that those virtual surfaces aren't actually flat, but rather they are pieces of spheres! As Rudolf Kingslake explains, "...the complete theory of the Abbe sine condition shows that if a lens is corrected for coma and spherical aberration, as all good photographic objectives must be, the second principal plane becomes a portion of a sphere of radius f centered about the focal point." This actually does matter in practice, as Kingslake explains two sentences earlier: "It is a common error to suppose that the ratio of Y/f is actually equal to tan(theta) and not sin(theta)... The tangent would, of course, be correct if the principal planes were really plane. However...". In other words, every time you read something like "the effective f-number of a lens is approximately equal to 1/(2*NA), or more precisely 1/(2*tan(asin(NA)))", you should mentally delete that stuff about "approximately" and "more precisely..." The 1/(2*NA) formula is correct, and it's because the principal plane is really a piece of a sphere. I notice this because I've written that stuff more than once, it's wrong, and now I have to figure out whether it's worth going back to flag the errors. 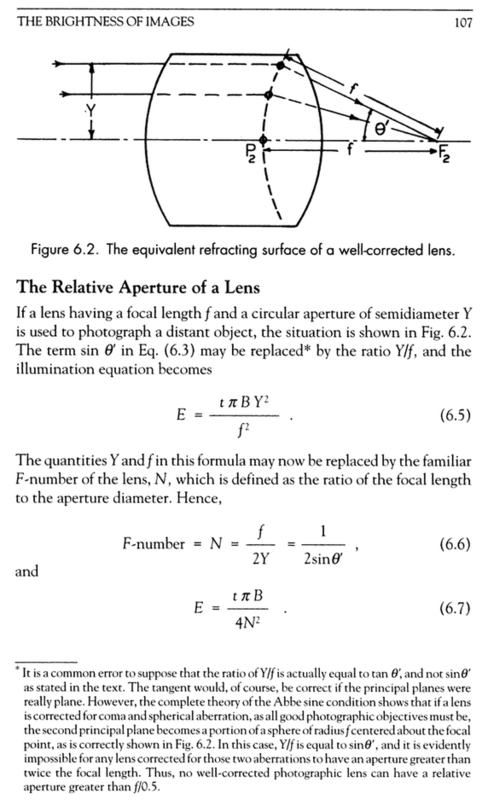 "Optics in Photography", Rudolf Kingslake, 1992, page 107 footnote, Google Books extract HERE. Likewise there's a simple change that means you don't need to worry about entrance pupil location or focus relationships. Just refine the equation to say that it's the effective aperture that we're talking about, after all those other things are factored in. which is simple, tidy, and I believe exact -- at least in the limiting case of refractive index equal 1. I'll have to look into the details, but the essence of what you are saying is that if you look at it approximately, it is an approximation, but if you look at it exactly, it is exact.... interesting phenomenon! I never thought of it that way, but I like that formulation! "Numerical aperture and f-number are obviously two methods of defining the same characteristic of a system. Numerical aperture is more conveniently used for systems that work at finite conjugates (such as microscope objectives) and the f-number is applied to systems for use with distant objects (such as camera lenses and telescope objectives). For aplanatic systems (i.e. systems corrected for coma and spherical aberration) with infinite object distances, the two quantities are related by: f-number = 1/2N.A." He also shows on p. 18, the principal "planes" as curved (quotes his). So, overall, 1/2NA is only exact for certain situations, as Rik mentioned. You do have to account for the "effective focal length (EFL)", not just the catalog value. Thanks for the follow-up. I was not aware of any other relevant quote, only the one from Kingslake, so I'm happy to learn about this one from Smith also.